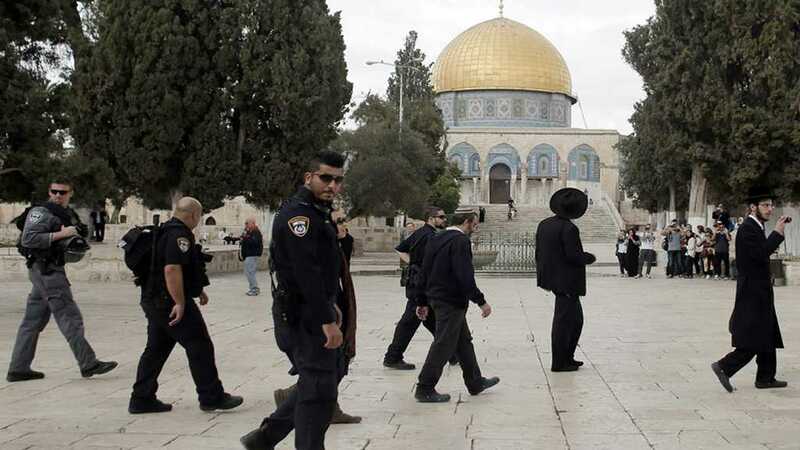 Zionist Police extended illegal bans on top Palestinian officials who oversee occupied al-Quds’ Aqsa Mosque from entering the holy site. The move, which is destined to escalate tensions, came on Sunday weeks after the Islamic Waqf Council, a religious body appointed by Jordan to oversee the sacred compound, defied a 16-year ‘Israeli’ ban on the Bab al-Rahma building within the site and reopened it to Muslim worshippers. Following the council’s decision on February 14, head of Islamic Waqf Sheikh Abdel-Azeem Salhab and his deputy, Sheikh Najeh Bkerat, were briefly detained and hit with a one-week ban. ‘Israeli’ police extended the bans on Sunday by 40 days for Salhab and four months for Bkerat, according to a spokesman for the Waqf Council. The Zionist occupation authorities shut down Bab al-Rahma in 2003, claiming the site was being used by members of the Islamic Movement in the occupied territories for political activities, an allegation the Waqf Council denies. Among them were Arafat Naib, a guard at the Al-Aqsa compound, who was banned from entering the site for six months, and Nasser Qous, a Fatah party official in occupied al-Quds, who was also barred for 40 days.